If we ask an ordinary person who knows about nuclear energy, many will say: nuclear energy serves to produce electricity and to make nuclear bombs, and it is very dangerous, since it produces highly toxic radioactive wastes that last thousands of years, and producing horrible cancer and genetic mutations. Being able to say that nuclear energy is malign, cheap but malignant energy. Is this true? Who gave us this information?Citizens know, is what we have been taught in schools and in the media, and we have proven in our lives, that they have taught us a mixture of true information, wrong information and in some cases they have taught us lies to take advantage of our ignorance. The previous video was produced by the army of the United States at the time of the cold war (1957), with the purpose of spreading it, if a nuclear war was produced, to take away the fear of the population from nuclear bombs, the five subjects the cameraman died at old age (86, 83, 71, 78, 91 y 84). If the nuclear radiation is so dangerous, how is it that the 5 soldiers of the video agree to participate in a suicide test? How is it that they allowed the press and high level military personnel to expose themselves to radioactive contamination, precisely at the point where did the first nuclear bomb explode 3 months ago? 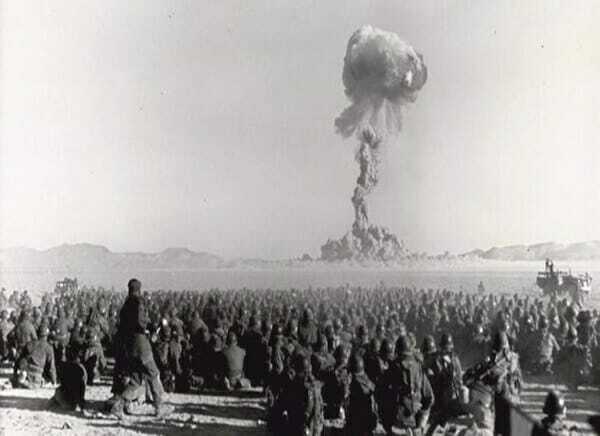 How did they allow hundreds of North American soldiers to expose themselves to the danger of being so close to a nuclear explosion? Yes we answer saying, that the products of the Manhattan project on the site Hanford, if we respond saying that the products of the Manhattan project on the site, did not know about the effects of nuclear radiation on humans, we would be talking about their ignorance, they produced thousands of deaths from cancer, not only to these soldiers, but also to the thousands of people who worked with them on the Hanford site, and their children would have genetic defects. Where are the thousands of cancer deaths and the thousands of children with congenital defects? Did they hide the corpses and erase the records? Nuclear radiation is not as dangerous as we have been taught. The nuclear bomb does not exist (there are people who believe that). Nuclear radiation is super dangerous, but they hid the corpses. What do the people with direct experience tell us, who worked from the start in the nuclear reactors of the Hanford site where the atomic bomb was produced? You can see another video of Galen Winsor here. Galen Winsor died due to natural causes in 2008 at 84 years old, worked at the Manhattan Project facilities in Hanford, Washington; National Laboratories and at the Oak Ridge nuclear power plant in Oak Ridge, Tennessee; General Electric nuclear fuel recovery plant Midwestern in Morris, Illinois; General Electric nuclear fuel manufacturing plant in San Jose, California and Wilmington, North Carolina; and has worked on all the major nuclear reactor dismantling projects in the USA. Nuclear radiation is only dangerous at extremely high levels. There is a conspiracy between governments, electric power companies and oil companies to maintain a campaign of terror against nuclear energy and to continue to charge high prices for energy to citizens. Galen Winsor “If nuclear energy were developed as it should be, the price of electricity would be so low, that it would not be worth measuring, only a small fixed monthly fee would be paid”. This great revelation leaves us many more questions to answer, and nuclear accidents? What happened at Chernobyl, Fukushima and Three Mile Island? In Chernobyl 31 people died in total, all during the explosion of the plant or by direct exposure to the active nucleus of the nuclear reactor, no one died by radiation outside the plant, and of the 134 people who received lethal doses of radiation inside the plant, only 28 died of radiation, the other 106 that have been dying at the same death rate as the population of their countries. And Chernobyl is today a refuge for wildlife, where plants and animals thrive in abundance, without any strange mutations or genetic defects. In Fukushima, no one died of radiation, but 1,605 people died due to the effects of psycho-terror on radiation. Today Fukushima also became a paradise for wildlife. Three Mile Island, another accident without deaths or injuries, or carcinogenic effects or birth mutations in the population. Which this produced was an increase in the electricity tariff for citizens and an expenditure of more than a trillion dollars that enriched a few. Pictures of the islands where the nuclear tests were made the photos of the islands show abundance of wildlife, without mutations, without new species, or monsters, or godzilla, or cancer. The same phenomenon of abundance of wildlife occurs in Chernobyl and Fukushima. More details in the doctor Jane Orient’s Work. What does the scientific and medical community say? The nuclear radiation values established today, as dangerous for the human being, come from political pressure in the 1950s to impose the work presented by Hermann J. Muller in 1946, which said that the effects of nuclear radiation are cumulative in the living beings, and therefore, even the lowest levels are dangerous. Many scientists objected, because although it is true that nuclear radiation damages cells, the cells have repair mechanisms because they are living biological organisms. The verification is as simple as observing that there are places on planet earth, where humans have lived for thousands of years, which have up to 10 times the maximum acceptable radiation according to Muller, without presenting significant variations of cancer or congenital defects in comparison to the rest of the country, such is the case of Guarapari, Brazil; Kerala, India; Ramsar, Iran; Yangjiang, China. The explanation of this discrepancy is obvious, a government – energetic corporations conspiracy. To impose a psycho terror on the world population and get rich in the process. In fact, there are many scientific works demonstrating that small doses of radiation are beneficial being its foundation the hormesis. and Bernard L. Cohen, professor of physics at the University of Pittsburgh, made the largest and most comprehensive study of the effects of nuclear radiation and cancer, compared radon exposure rates and lung cancer in 1,729 counties covering 90 percent of the population from the EE. UU. His study in the 90’s decade, found far fewer cases of lung cancer in those counties with the highest amounts of radon. From 1940 to 1970, nuclear radiation was used for the treatment of serous otitis, through the introduction of a radioactive capsule in the nose, this treatment was known as NRI, and it was a simple and effective treatment, which stopped used due to the psycho terror of radiation. Now less effective treatments are used using antibiotics, drugs and surgical operations. Several countries followed the patients who received this treatment to determine if it produced cancer, resulting that there was no difference with the rest of the population of the country. In 1970, by mistake, an apartment complex in Taiwan was built with cobalt 60, a radioactive element, ten years later the error was discovered, and for ten more years the inhabitants were followed up, to check the effects of radiation producing cancer and genetic defects, the results were surprising, the rate of cancer turned out to be 20 times less and the rate of genetic defects was 15 times less, of the rest of the population of Taiwan. Indicating that certain radiation levels are beneficial for the human being, by activating the immune system of the human body and by repairing the cells. A nuclear reactor works like a nuclear bomb. False, a nuclear reactor burns the radioactive material slowly releasing a constant heat, a nuclear bomb exploits the radioactive material so that it releases its energy instantaneously, producing great destruction. Nuclear reactors can explode at any time. False, the traditional reactors work with water and therefore are of low temperature, they were designed to produce plutonium, nuclear weapons and the so-called “radioactive waste”. They work like a giant pressure cooker, and are as dangerous as any pressure cooker (pressure cookers are dangerous). There are designs of nuclear reactors, which do not use water, they are not a pressure cooker, they do not have high pressure and therefore they can not explode. Only some chemical elements are radioactive. False, all chemical elements are radioactive, some isotopes are much more radioactive than others, for example potassium 40 is much more radioactive than potassium, 39 and that is what makes common radioactive bananas. And as we have described in this article, bananas do not represent a danger to health. Nuclear radiation is the normal process of disintegration that happens to all matter, some isotopes disintegrate more quickly than others. Nuclear reactors produce radioactive waste, highly toxic materials. False, nuclear reactors produce high-value chemical elements, which can be used in medical applications as well as specialized devices such as smoke detectors, sterilizers of medical material, and are also fuel for high temperature (800ºC) nuclear reactors, that burn everything and last 20 years without refueling, compared to low temperature reactors that require re-supply every 2 years. These so-called “waste” have a very high value per gram in the market, which exceeds thousands of dollars per gram. Nuclear reactors are a human construction, they do not exist in nature. False, 16 natural nuclear reactors have been discovered on planet earth, the most famous in Oklo, Gabon. and they have produced the so-called “radioactive waste” which, as expected, almost does not exist since they have disintegrated because they are radioactive. The good nuclear reactors are those of fusion, and the malign ones are those of fission. False, in the fusion reactor we want to merge an atom of a proton (hydrogen) with another atom of a proton (hydrogen) to obtain an atom of two protons (helium). In the traditional nuclear reactor, we want to divide (fission) the atom of 92 protons (uranium), we obtain atoms with a smaller amount of protons like cesium (55 protons) by fission of uranium, but we also obtain atoms of more protons (like the plutonium that has 94 protons), by fusion of uranium with an alpha. This is the reason why the traditional nuclear reactor is called a nuclear reactor and not a fission reactor. The confusion originates in that we want to produce fission but we obtain fission and fusion. Without fusion we can not produce larger atoms (plutonium 94) from smaller atoms (uranium 92). Note: Alpha is another name given to the special helium atom (an atom of two protons). Nuclear bombs give peace in the world, and allow countries with atomic bombs to win any war. False, there are still many wars around the world, not counting violence for common crime. And the USA lost the Vietnam War in 1970. Thanks to the nuclear bombs launched in Japan, the Second World War ended in Japan. False, world war II ended in Japan because Russia stopped being neutral with Japan. A few days after Russia invaded Japan, Japan surrendered. The two nuclear bombs launched in Japan served as an excuse for the surrender of Japan to a war on two fronts, the US on one side and Russia on the other. Recall also that a few months before these events USA gave not only nuclear material to Russia, but also taught him how to build the atomic bomb. A nuclear bomb destroys a city, but it does not destroy an army and as long as there is an army the war can continue. A nuclear war could end life on planet earth. False, a level 7 earthquake or the eruption of a volcano or a category 3 hurricane have the energy of 1,000 atomic bombs. If we added the destructive power of all the atomic bombs in the world, still, we could not reach the power of a single level 9 earthquake, or a super volcano, which is equivalent to 100,000 atomic bombs. Of course, a war with nuclear bombs would destroy cities, kill millions of civilians, but it would not end a war or end life on the planet. Nuclear energy is a limited resource. False, not counting the extraction of uranium from landmines, we can extract uranium from seawater cheaply and we would have uranium to produce energy for 100,000 years. What good is all this new information? Decrease the electricity payment x 10. It is estimated at 2 cents of a dollar or less per kilowatt (currently paid from 12 to 30 cents). Aircraft that do not need to refuel in 20 years. with more free space, since half the weight of an airplane when taking off is the weight of the fuel. Boats that do not need to refuel in 20 years, with greater free capacity, since a nuclear reactor for a ship is 1/3 of the current size of the combustion engine they own and without the need for giant fuel tanks and twice as many rapids. High-speed trains that do not need refueling in 20 years. Rates of transportation of people and goods at very low cost and faster. Decrease in the cost of production of all products, from telephones, refrigerators, cars and houses, since the main cost of production is energy. Increase in local jobs with local energy production. Decrease in the importation of fuels and the financing of wars for resources. Manufacture of fossil fuels using the heat of nuclear energy and extracting CO2 from air and seawater. Allowing to close the CO2 cycle. What can I do to do this? Subscribe to our mailing list, to be informed of our progress. Share this article with your family and friends, in the union of the many this strength. Support us financially to disseminate this information and make cheap energy a reality. We have been deceived by a government – corporation conspiracy, which has implanted wrong ideas in our mind by repeating a lie a thousand times, all in order to maintain a cartel with high energy prices. But times have changed, and the pollution and global competition between China USA and Europe, is leading us to return to the development of nuclear energy as an abundant, clean and very low-cost energy source. Articles similar to ours, have already been published for some time,also European documentaries with this same message have come to light, scientific support exists, and the recent announcement of the USA EPA government agency, is timidly appearing in the media. 01-2019, USA changed its nuclear regulation a bit to facilitate the development of new nuclear reactors, Nuclear Energy Innovation and Modernization Act, this is the product of the pressure that China is on the front of the development of the new nuclear reactors, the USA is catching up, will Europe be left behind? . The energy monopoly of both electricity and fuel has its days numbered, a great victory for citizens is on the horizon.